R3-D5 is an Astromech Droid minifigure of Jedi Master Saesee Tiin's droid from the Star Wars theme. The droid appears in the set 9498 Saesee Tiin's Jedi Starfighter. R3-D5 is similar in appearance to any other astromech droid. 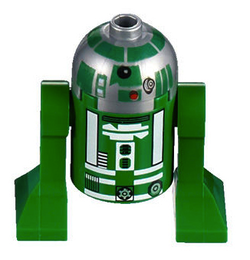 R3-D5 features green legs and a green body with printing similar to that of R8-B7 except in white. The dome is metallic silver with mostly green printing. R3-D5 was an R3 series astromech droid that was in service during the Clone Wars. He was known have to co-piloted Saesee Tiin's Delta 7-B Jedi Starfighter on at least one occasion, in a battle above the planet Lola Sayu.